Ah, prom. It’s the one high school event that is truly loved, hated, feared and anticipated all at once. There’s just something about prom that can make even the most down-to-earth, rational person into a frenzied lunatic, and that goes for both adolescents and adults. For most teens, prom is just about the closest they are ever going to get to being royalty, and the days and weeks of careful preparations rival that of the upcoming royal wedding. There are dresses to buy, tuxedos to rent, transportation to arrange, flowers to choose, hair appointments to schedule. Girls start tanning months in advance to get rid of the pesky tan lines that would look awkward should they choose a strapless dress. They choose earrings and necklaces to compliment their gowns, and make sure their dates choose coordinating vests and neckties. High school students who are already dating someone have it easy, because they already have a date on standby. For the single folk, prom can seem more like the impending apocalypse. Some take the easy way out and simply choose to go with a group of friends–no fuss, no hurt feelings, just a bunch of kids who want to have a good time without any drama. Others are faced with the choice to either ask someone to be their date, or go it alone. Choosing a prom date is like playing a game of Russian Roulette–you just never know which choice is going to blow up in your face. I was very fortunate when it came to prom. I ended up going all four years–as a freshman and sophomore because my boyfriend was two years older than me, and with good friends my junior and senior year–and had a good time. I can’t say that it lived up to all the hype, but I enjoyed spending time with my friends there. I’m actually sort of glad that all my old photos and yearbooks are still packed away from our move or I might have had to dig out a photo from one of my proms to add to the blog today. (Did I just hear you groan with disappointment?) I’m sure you would have gotten a few chuckles from it because there’s something strange that happens when a tomboy like me tries to actually wear makeup. I guess when you only wear powder and maybe a dab of concealer on a daily basis, any bit of extra color on your face instantly transforms you into a Tammy Faye Baker lookalike. I was also never one for bright, flashy colors, so I wore black dresses all four years (well, junior year my dress had a white strip running across the chest and down the side). That’s right, I was a regular Morticia Addams, minus the pasty white skin. So, since I spent so much time today uploading and sorting photos from Katie’s prom extravaganza last weekend and didn’t have a chance to actually take a photo for today’s blog (or ressurect one of my glamorous old photos), I’ll just share one of my favorites of Katie from our day together. I’ll say one thing, I certainly don’t remember being even half as gorgeous when I went to prom! Today’s 365 Project entry is dedicated to my dear Miss Katie, a girl who is beautiful both inside and out. I hope you enjoyed every minute of your special day! >Wow!!!! This is really cool. Katie is a beautiful girl. 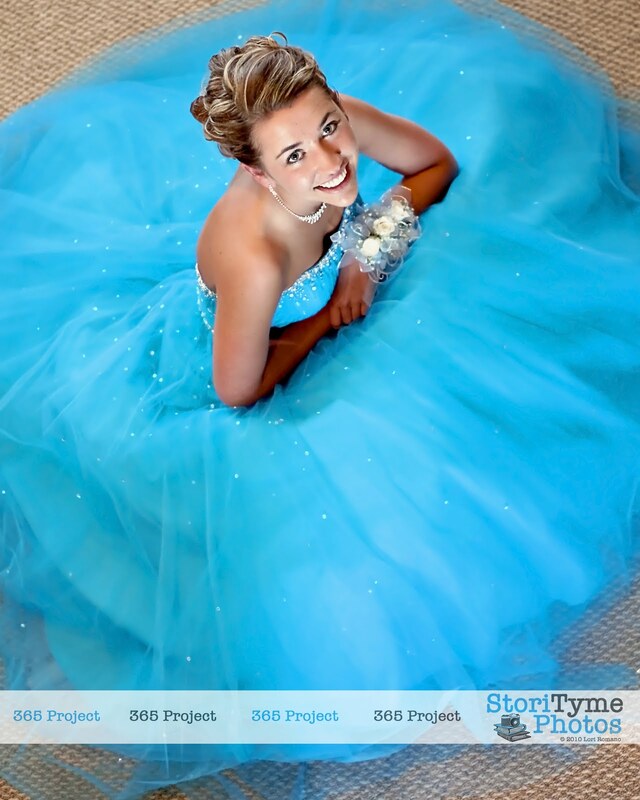 This is one of the prettiest prom dresses I have ever seen.